The Citizens’ 4-1 loss to Cowdenbeath six days ago – their worst league defeat of the season – has left their Ladbrokes League Two title hopes hanging by a thread. With just four matches remaining, City trail leaders Peterhead by six points ahead of tomorrow’s showdown with another of the league’s title hopefuls Clyde at Ainslie Park. Defeat to the Bully Wee, coupled with victory for Peterhead over Albion Rovers at Balmoor, would all but end City’s championship-winning aspirations and consign the club to a play-off place. 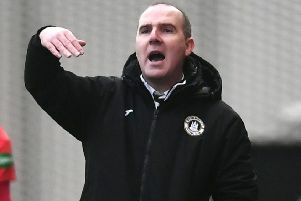 Although McIntyre insists that would be an achievement in its own right given the club’s struggles in Scottish football’s fourth tier since earning promotion in May 2016, the squad cannot afford to let all their hard work go up in smoke. The left full-back, who turns 25 next week, says now is the time to rediscover the form that saw James McDonaugh’s men embark on a 12-match winning run earlier in the campaign. “Last week against Cowdenbeath was just one of those games that football throws up now and then. We didn’t start well and it went from there. It’s one to forget for sure. We weren’t complacent going into the game but we just weren’t at the races,” said McIntyre, who joined from East of Scotland outfit Tynecastle last summer. “Everything the gaffer did say after the game was fair. It was the probably the worst performance of the season so hopefully we’ve got it out of our system. It’s not something we want a repeat of and especially at this stage of the season. These are the games that matter now. We need to raise the spirits again and the only way you can do that is by picking up results. We have to look to the form that we were on earlier this season. “We haven’t made it easy for ourselves if we want to win the league. With Peterhead drawing last weekend that was a real opportunity to close the gap and I think that’s the thing that hurt the most losing to Cowdenbeath. With Clyde likely to be City’s opponents in the first round of next month’s play-offs should neither side manage to overhaul Peterhead, McIntyre believes tomorrow is an ideal opportunity to put down a marker. “If it is play-offs then tomorrow will be a huge game as it’s looking as though we’d play Clyde,” he said. “It’s the chance to get in their minds a bit. The games against Clyde this season have been very tight. It’s always been nip and tuck. They won at Ainslie Park last time out so that’s another incentive for us. It hurts that little bit more when you’re beaten at home. “But it really has been an incredible season no matter what happens. I’ve played in every game apart from Peterhead at home when I was concussed (1-1 draw in December) so from a personal view it couldn’t have gone much better.